We are World Cup Ready! Following our US National Team through this exciting tournament seems to be popular for just about everyone these days. Aside from dreaming over visiting Brazil ourselves, we love watching the games and cheering on our favorite teams. The real question is...is your home ready for the World Cup? Whether your kids are soccer stars themselves or just big World Cup fans, our Kids Soccer Chair and Ottoman is a fun fit for any room. The ottoman fits nicely inside the chair's seat when it's not in use and is the perfect foot rest for relaxing and watching the game. Kids love the swivel feature on this chair to easily view every area of the room. An easy purchase online at BelfortFurniture.com, this chair is in-stock now and ready for the World Cup. Plus, it's always free to pick-up items from our distribution center! Join us in cheering on Team USA! Want to see this chair up close and personal? 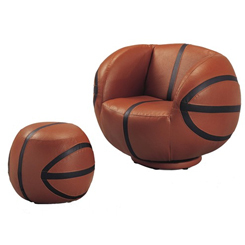 Visit our Kids Showroom to see the Soccer Swivel Chair & Ottoman, along with the Basketball Chair & Ottoman, the Football Chair & Ottoman, and the Baseball Chair & Ottoman. For more kids chairs and children's furniture visit the Kids Showroom in our convenient Dulles, Virginia Furniture Campus! Our knowledgeable staff are here to help and ready to assist with your furniture selection process. Looking for some design help? Visit our easy online Design Help page here to send us your ideas, inspiration, and questions - we're ready to help get started creating your next beautiful room.